Eleven months since we embarked on our turbulent adventure into van ownership, we are finally nearly finished with all our mechanical repairs, the camper conversion is pretty much completed and we’re excited to share the outcome - so here goes with Part Four! Following our first trial of the camper unit which revealed many flaws in our original design, we spent the past few months building additional components and expanding upon our existing removable camper box to make something more permanent, liveable and cozy. Our first step was removing one of the rear passenger seats and installing an insulated plywood sub floor, onto which we used vinyl flooring. This was one of those jobs that was made to look easy on all the YouTube videos we watched before starting but turned out to be a bit of a nightmare; cutting the plywood to fit around the sliding runners for the rear passenger chair we were keeping was a real challenge and we made the mistake of gluing down wooden batons to the van floor in sub zero temperatures which caused the adhesive to crack so we had to do the whole job twice! We used a mix of closed cell foam and reflective bubble wrap for the insulation and it’s pretty warm but I think this is one job that we will redo in the future with better materials. Now though at least we had a solid, wooden base onto which we could build. Lots of sketches and research later we decided upon the design of the camper unit MKII. By now we had given up on the idea that the unit should be removable and opted to prioritise comfort and storage space. 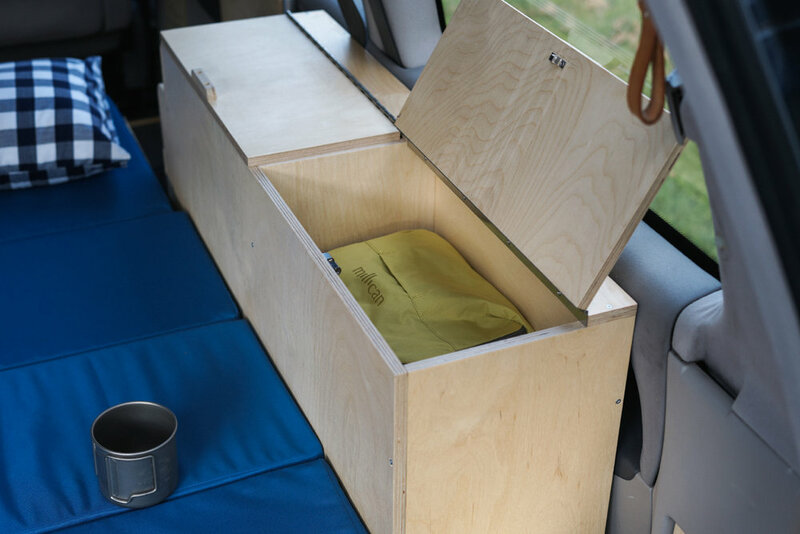 We wanted a bench seat that we could sit on facing either in or out of the van, the back rest of the seat would also double as the support for the fold out bed. We wanted storage for large items such as a cooler, rucksacks and sleeping bags, and we needed cupboards and a surface onto which we could at least boil some water on our hiking stove in case we were forced inside by the rain. We built all this from 2 large sheets of 12mm birch ply plus a couple of piano hinges so the cost has been very modest in relation to the added functionality we’ve gained. We made cushions for the bench that double as a mattress and replaced the flimsy sliding factory fitted curtains with heavyweight blinds that are secured to the van with self tapping poppers. We also made a folding table which is supported by a telescopic leg and a few other storage trays for smaller bits and pieces. See the photos above to see how it turned out! Other jobs we have completed since our last post include, replacing both front brake calipers after one seized on us causing the van to nearly overheat, replacing the glow plug relay for a second time due to the first replacement being faulty, had nice new all terrain tyres fitted, some welding done and we also treated the underneath of the van with a rust converter and underseal. Phew. Finally, after all this energy and effort lay one last trial - the Delica’s first MOT test since it has been in our ownership. We were mildly concerned; what if it failed catastrophically and we couldn’t afford to fix it? Would all our work have been in vain?